I stalk Boots regularly because they always seem to be out of my favorite nail polish remover (reviewed here) so I’m always on the look-out for when they restock it. At the moment, I’m fully stocked up (hauled here) but at an earlier visit to Boots I managed to spy a few things that seemed quite interesting! Mavala Mavadry Spray was the first thing that caught my eye. I’ve heard of the Swiss brand Mavala before, but only that they sold nail polish. I’ve never heard of a spray that cuts down the drying time of nail polish before, from this brand or any other, ever! Apparently, “Mavadry Spray dries nail polish in seconds, prevents chipping and makes manicures more brilliant.” On one hand, this could very well lead to disastrous results if sprayed too soon on freshly painted nails, ruining the manicure and ultimately end up being time-consuming (because then you’d have to fix the polish or take it off all-together). On the other hand, if you wait for a minute and the spray it (from a distance of 30cm) and the polish does in fact dry down in a matter of seconds, well that’s a definite game changer! Regardless of whether it works or not, the concept alone sounds pretty interesting and fun so I wanted to try it out for myself. Bourjois Instant Dry Nail Drops were also available at the Bourjois stall at Boots and I honestly couldn’t decide between this and the Mavala Mavadry Spray so I just got them both. I know, I know, I’m insane. 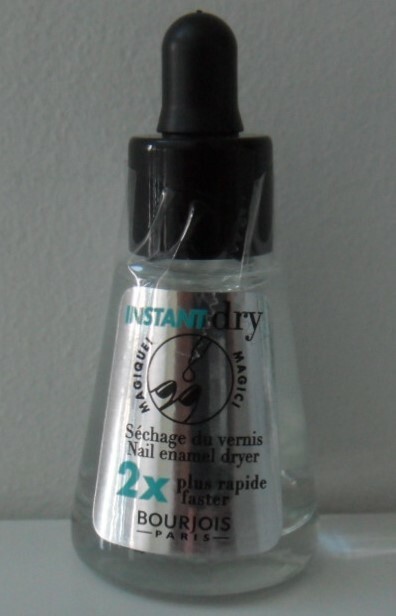 Anyhow, the lovely lady who does my nails at my local salon always uses a product that’s similar to this – a drop on each nail – to dry my nail polish almost instantly, which I always found intriguing. I don’t believe it’s from the same brand but the one from Bourjois retails for KD 4/000 in case you are interested. I’ve also started noticing at lot of The Vintage Cosmetic Company products at Boots, everything from false lashes to all kinds of makeup brushes and tools even. Their vintage glam packaging kinda’ reminds me of Benefit and Soap & Glory. I decided to pick up a pair of false lashes that strongly resembled my all-time favorites (Sonia Kashuk Full Glam). The pair I got was called Kitty but these were also available in the styles Betty, Connie, Gracie, and Nancy. Lastly, I picked up a pack of Invisibobble (the traceless hair ring) in “True Black” at the checkout counter. I believe I purchased a pack from Daiso from a different brand, years before I even knew what they actually were and how to use them. When Beauty.com started selling them (Invisibobble brand) I held back on purchasing any because of the ones I already had. Now that the ones I used to own have disappeared to wherever bobby pins, hair ties, scrunchies and the like are always disappearing to, I felt I was justified in making this purchase.